In 10-inch nonstick skillet, cook onion, chiles and chicken over medium-high heat about 3 minutes or until chicken is warm and onion is starting to turn translucent. Remove from heat; stir in yogurt, 1/4 cup of the cilantro, and the lime juice. Stir in 1/2 cup of the enchilada sauce. Fill each tortilla with 1/4 cup chicken mixture. Roll up; place seam side down in baking dish. Spread remaining enchilada sauce over tortillas; sprinkle with cheese. Bake about 30 minutes or until cheese is melted and bubbly. Sprinkle remaining cilantro over enchiladas; serve warm. If you like a spicier enchilada, use hot enchilada sauce. 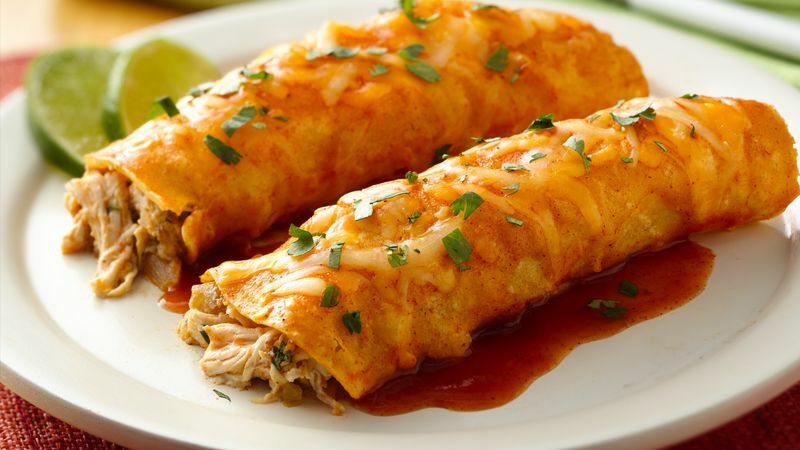 If desired, serve enchiladas with salsa and shredded lettuce on the side.